More and more people want the purity of organic produce and nothing can match the flavor of a home grown organic tomato. Growing organic tomatoes, as shown in Figure 1, requires more work and more patience than growing tomatoes with the use of chemical fertilizers and pesticides; however the end result is well worth your efforts. A package of "certified" organic tomato seeds; always check the date on the package. Follow these simple steps and you will have end up with organic tomatoes that will delight any pallet. Create a mixture of 90% potting soil and 10% organic compost. Add water, if necessary so that the resulting mixture is moist but not wet. Fill the biodegradable seed starter pots with the soil compost mixture, leaving about 3/4 of an inch from the top of the pots. The soil compost mixture should be compacted to a firm state in the pot. Place 2 or 3 or the certified organic tomato seeds in the center of each pot and cover with about 1/2 an inch of the soil compost mixture. The seed pots should be placed in a sunny location. This can be inside the home, where the pots get direct sunlight through a window, outside if your climate allows or in a greenhouse. Check the seed pots daily and ensure that the soil is moist to the touch. Continue to monitor the seed pots even after the tomato seeds have begun to sprout. Note: You must ensure that the tomato plants are receiving enough nourishment from the soil compost mixture. If the leaves on the tomato plants are pale or yellow this is a sign that the plants are not receiving enough nourishment. If you experience pale or yellow leaves add some additional organic compost to the seed pots. Once your organic tomato plants reach a height of 4 inches you can consider planting them in your outdoor garden, providing that you will not receive any nighttime frost. The soil in your garden needs to be prepared for the planting of your organic tomato plants. In order to maintain the integrity of the "organic" tomato plant, the soil that the tomato seedling is planted in must also be organic. This can be accomplished by placing a 4 inch layer of organic top soil on top of the current soil. The pH if the soil should be checked. 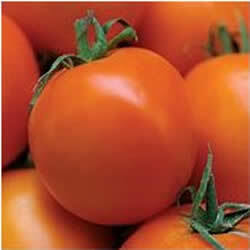 A pH of 6 will provide the ideal growing conditions for your organic tomato plants. If your pH is not 6, visit a local garden center and they will advise you what and how much organic product to use to bring your pH to the correct level. Once your organic soil is properly prepared plant your organic tomato seedlings approximately 6 to 8 inches apart. By using biodegradable seed starter pots it is not necessary to transplant the organic tomato seedling. Transplanting is always a shock to any plant. Dig a hole in your organic soil so that the top of the seedling pot is approximately a 1/2 inch below the top of the organic soil. Place the seedling pot in the hole and cover the starter pot with soil. After planting the organic tomato seedlings in the garden they need to be watered. You may wish to consider the use of drip irrigation. Drip irrigation is not only economical, it ensures that the organic tomato seedlings receive the correct amount of water. You can also use a soaker hose strategically placed so that the water is applied to the soil and will penetrate to the organic tomato seedling roots. Note: Do not use a sprinkler or garden hose. You do not want water to remain on the leaves of the tomato plant as this can lead to the growth of fungus or leaf scorching on very hot and sunny days. 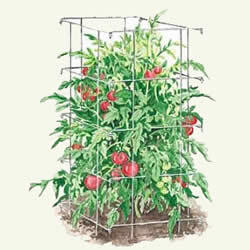 I recommend the use of tomato cages, as shown in Figure 2, over each seedling. The tomato cages provide support for the tomato plant stems and will help to prevent the stems and the tomatoes from ending up on the ground as they grow and develop into large plants. You must monitor your organic tomato seedlings as they mature into plants for insect problems and infestations. Ladybugs are the organic tomato grower’s natural defense against insects. But, you cannot depend on any method other than to physically remove any visible insects from the plants on a daily basis – this is where the patience is needed to successfully grow organic produce. Note: If you have an insect problem on your organic tomato plants that needs additional control methods, visit your local nursery or contact your local agricultural department for advise. There are numerous organic pesticides available that can be used to help control insect infestations on organic produce.